Add to Calendar 2/3/2019 true 720 Half Price Big Game Sunday at Topgolf We’re showing Tuesday some serious love. 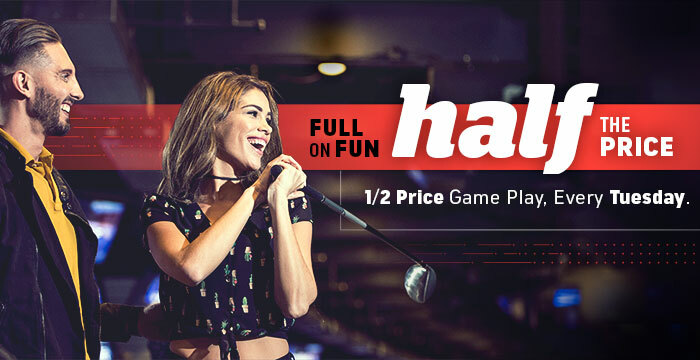 Game play is now half price all Tuesday long at Topgolf for a limited time. No coupon needed, just walk in and play! Offer does not apply to events. Cannot be used in conjunction with any other offer, discount, event or party. Exclusions: (1) Not available in Baton Rouge, Las Vegas, Myrtle Beach and Scottsdale (2) Not valid for arcade games. Along with Tuesdays, we’re also showing Sunday, February 3rd some serious love. Game play will be half price on this one and only Sunday. Don't miss your chance to score more for less with an offer that is as simple as it sounds. *Not available in Atlanta Midtown, Las Vegas, and Myrtle Beach locations. Offer does not apply to events or parties. Cannot be used in conjunction with any other offer, promotion or discount. Not valid for arcade games in Allen, Centennial, Roseville and San Antonio. Offer subject to change.